Running Press Adult, 9780762465361, 128pp. Go from aww to awful! 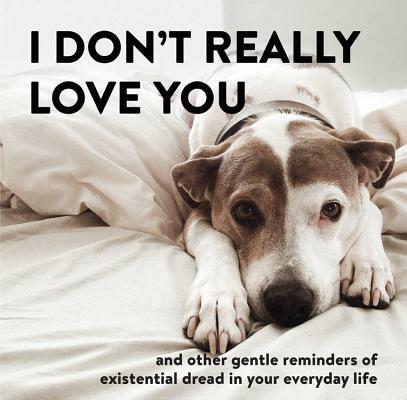 with I Don't Really Love You, a darkly humorous collection of adorable pet photography and soul-crushing one-liners, based on the popular Instagram @365DaysofDread. Drawing on the black humor of author Alex Beyer, I Don't Really Love You takes readers on a journey from delightful to depressing (and back again!). Dead pan captions, from "Birthdays don't matter" to "Inadequacy haunts me endlessly," peek out from behind the forms of calm cats and happy-go-lucky puppies, creating an unexpected contrast and offbeat appeal. Pet lovers and humor lovers will be captivated in equal measure, with more than 75 full-color photographs of cats and dogs in a range of breeds, alongside an off-beat, subversive voice. With the perfect attitude for our rapidly changing world, this quirky book will make readers laugh out loud (after sending them crawling under the covers to contemplate their existence).